Pinellas County was formed in 1912, when it separated from Hillsborough County. A popular beach destination, magazines routinely rate Pinellas County beaches among the best in the entire country. However, with only 280 square miles and a booming population of 916,542 as of the 2010 Census, Pinellas County is perhaps the most densely populated county in Florida. Even Miami-Dade County, with its dense urban atmosphere near the coast has a significant amount of undeveloped land in the Everglades. No similar amount of undeveloped land is found in Pinellas County, with the exception of the Brooker Creek Preserve north of Oldsmar. 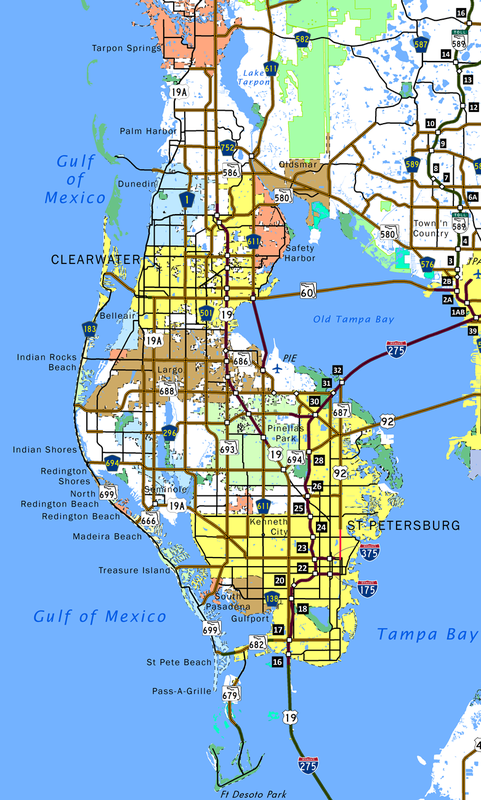 This page covers the system of state and county roads in Pinellas County, excluding Interstates, U.S. Highways, and Florida 60. Not all state and county roads in Pinellas County are profiled here. There are several freeways that were planned but were canceled and not constructed. One of these was the Pinellas Belt Expressway, which was touted as a beltway that would connect with the Interstate 275 and Interstate 175 interchange at its southeastern end. It was then planned to follow today’s U.S. 19 Alternate/Florida 595 west to Seminole Boulevard and then aim north, connecting with the unconstructed Ulmerton Road Freeway (Florida 688, which is no longer slated to be upgraded to a freeway) and then merging with the canceled St. Petersburg-Clearwater Expressway, a diagonal route from Interstate 275 north of the Interstate 275/375 interchange and angling northwest to Largo near the U.S. 19 Alternate and Florida 686 (East Bay Drive) intersection. The Pinellas Belt Expressway was actually budgeted for construction in 1974, but local opposition prevented the freeway from progressing. This freeway would have taken via eminent domain a good deal of commercial areas, including retail outlets, but several homes would also have to be condemned and removed. This was unacceptable to residents, so the freeway was canceled by the late 1970s. However, certain segments were built, including the full freeway interchange between U.S. 19 Alternate and Florida 666 in Bay Pines/Seminole. Split into two segments, with a portion relinquished from state control through Safety Harbor, State Road 590 is an L-shaped route in northern Pinellas County. The state road lines Drew Street, an urban boulevard east from U.S. 19 Alternate outside Downtown Clearview to NE Coachman Road. Angling northeast, Coachman Road connects with U.S. 19 at 10th Avenue South, which extends SR 590 east to Dellwood and CR 611 (McMullen Booth Road). Through the city of Safety Harbor, SR 590 takes a stair stepped route along 10th Avenue South, 14th Avenue South, 4th Avenue South and 10th Avenue South again to Main Street (CR 576). State maintenance ends at 10th Avenue South and Main Street continues east through Downtown Safety Harbor to Phillippe Parkway. SR 590 turned north there and follows Phillippe Parkway as it parallels the west shore of Safety Harbor. North from Wateredge Court, the northern segment of SR 590 overlays Phillippe Parkway to SR 580 at Bridgeport. State Road 595 is a 37.31-mile long route that accompanies U.S. 19 Alternate throughout Pinellas County. The route is posted along side the U.S. 19 Alternate (5th Avenue North) spur east from U.S. 19 (34th Street South) to west end of U.S. 92 and SR 687 along 4th Street South in St. Petersburg. The remainder of SR 595 is unsigned along U.S. 19 Alternate north from Bay Pines through Seminole, Largo, Clearwater, Dunedin, Palm Harbor and Tarpon Springs. SR 595 and U.S. 19 Alternate conclude just across the Pasco County line at Holiday. Florida 666 is a 1.39-mile long connector that follows 150th Avenue and Tom Stuart Causeway between Florida 699 (Gulf Boulevard) in Madeira Beach and the three-wye interchange with U.S. 19 Alternate / Florida 595 (Bay Pines Boulevard / Seminole Boulevard) in Seminole. The interchange between Florida 666 and U.S. 19 Alternate is a remnant of a freeway that was once proposed for the Florida 595 and U.S. 19 Alternate corridor between Interstate 275 and Largo via Seminole. Known as the Pinellas Belt Expressway, this freeway was proposed in 1974 for construction by 1979, but it was removed from plans as a result of community opposition. Florida 682 is a 3.72-mile route that follows the Pinellas Bayway from Florida 699 (Gulf Boulevard) in St. Pete Beach east to Interstate 275 and U.S. 19 (34th Street South) near Eckerd College in St. Petersburg. Tolls are collected along the Bayway eastbound over the Intracoastal Waterway and westbound over Boca Ciega Bay Channel. The eastern portion of Florida 682 follows 54th Avenue South. State Road 686 is a 10.82-mile route that begins at the intersection of U.S. 19 Alternate (Seminole Boulevard / Missouri Avenue) and West Bay Drive in the city of Largo. Eastward, SR 686 travels east on East Bay Drive, changing into Roosevelt Boulevard at the diamond interchange with U.S. 19. 1.25 miles from there, Roosevelt Boulevard angles the state road southeast to St. Petersburg-Clearwater International Airport (PIE) and a merge with SR 688 along Ulmerton Road. The brief overlap with SR 688 takes the route between two wye interchanges by Feather Sound. Ulmerton Road extends east to end at Interstate 275 north while Roosevelt Boulevard resumes a southeasterly heading to Carillon, Interstate 275 south and finally U.S. 92 in north St. Petersburg. A portion of Florida 686 that is concurrent with Florida 688 near the airport was considered in the early 1970s for the Ulmerton Expressway, which would have followed all of Florida 688 from Largo east to Interstate 275. That freeway was canceled by the mid-1970s. The eastern end of the state road ties into a massive intersection that also marks the eastern terminus of Florida 694 (Gandy Boulevard) and the western terminus of unsigned Florida 600, the companion of U.S. 92 along Gandy Boulevard east toward the Gandy Bridge. This area is presently being upgraded as part of a three-year $83-million project running through spring 2017. Construction involves converting 2.5 miles of Gandy Boulevard to freeway standards with overpasses including one above Roosevelt Boulevard. State Road 687 runs parallel to Interstate 275 from Downtown St. Petersburg north to the Howard Frankland Bridge approach at Big Island. The state road runs almost entirely along 4th Street, with the exception of the one-way couplet through Downtown where northbound utilizes 3rd Street and one block of 5th Avenue North. SR 687 doubles as U.S. 92 between 5th Avenue North (U.S. 19 Alternate / SR 595) and Gandy Boulevard (SR 600 / 694). This overlap is fully signed. Historically Florida 687 continued south from its end at Interstate 175 and Florida 594 (5th Avenue South) through south St. Petersburg to Pinellas Point. This alignment utilized 4th Street South to Big Bayou and 6th Street South from there to 45th Avenue South and 4th Street South again to Pinellas Point Drive. Some maps show an east-west branch of SR 687 routed along Pinellas Point Drive, Royhanna Drive and 62nd Avenue South between U.S. 19 and 4th Street South. Florida 688 comprises a 13.33-mile long state road between Indian Rocks Beach at the northern terminus of Florida 699 (Gulf Boulevard) and Interstate 275 at Exit 31B in north St. Petersburg. Florida 688 follows 5th Avenue through Indian Rocks Beach, crosses the Intracoastal Waterway, then enters the vicinity of Largo via Walsingham Road. A direct connection from Walsingham Road to Ulmerton Road curves SR 688 northeast around Ridgecrest County Park to a due east heading to Largo Mall, northern reaches of Pinellas Park and St. Pete-Clearwater International Airport (PIE). Interchanges along Florida 688 (Ulmerton Road) connected the ends of the short overlap with Florida 686 by PIE Airport. The western exchange was removed as part of ongoing construction to build the tolled Gateway Express. Previous upgrades were considered in the early 1970s for Florida 688 as part of the once-proposed Ulmerton Expressway, a freeway that would have connected Largo with Interstate 275. That freeway was canceled due to local opposition by the mid-1970s. The Gateway Expressway is a two-prong toll road system that will link Interstate 275, U.S. 19 and St. Petersburg-Clearwater International Airport (PIE). SR 690 will overlay CR 296 (118th Avenue North / Bryan Dairy Road) as a four-lane elevated roadway west from I-275 to U.S. 19. SR 686A will comprise a four-lane viaduct system running along SR 686 (Roosevelt Boulevard) southeast from the Bayside Bridge (CR 611) to SR 690 just west of I-275. All electronic tolling will be implemented along both expressways. Costing $545 million, construction on the Gateway Express project commenced in November 2017. Associated work reconstructs Roosevelt Boulevard from the Bayside Bridge to SR 688 (Ulmerton Road), adds a new access road for PIE Airport, and expand I-275 between SR 694 (Gandy Boulevard) and SR 687 (4th Street North) with express toll lanes. Work runs through late 2021. Florida 693 begins in the business district of St. Pete Beach at the turn of Florida 699 from 75th Street to Blind Pass Road. The state road provides the first toll free crossing (Corey Causeway) of the Intracoastal Waterway northward from the Pinellas Bayway as it leads northeast to South Pasadena and St. Petersburg. Skirting the west side of Pinellas Park, Florida 693 travels on 66th Street North until merging with U.S. 19 (Florida 55) in eastern reaches of Largo. The state road is 11.96 miles long. Collectively Park Boulevard to the west and Gandy Boulevard to the east, the combination of County and State Road 694 travels across Pinellas County between Indian Shores and St. Petersburg. The county road portion originates at Florida 699 (Gulf Boulevard) along the Park Boulevard Bridge (78th Avenue Bridge) spanning the Intracoastal Waterway east to Oakhurst. The arterial route proceeds across the city of Seminole into Pinellas Park, where it becomes State Road 694 at 66th Street North (SR 693). Florida 694 extends 6.04 miles east initially as a commercial boulevard to The Shoppes at Park Place Mall and a SPUI with U.S. 19 and northeast as a controlled access expressway from Grand Avenue to the five-way intersection with 4th Street North (U.S. 92 and SR 687) and Roosevelt Boulevard (SR 686) in St. Petersburg. The Gandy Freeway was proposed as a 12.6-mile freeway that would have connected directly to the Gandy Bridge (and to the Leroy Selmon Crosstown Expressway in Hillsborough County). It was first considered in the 1960s but was canceled by 1979. A subsequent project started in 2014 upgrades Gandy Boulevard from I-275 east to 4th Street North to a freeway, with bridges over Dr. Martin Luther King Street (CR 803), SR 686 (Roosevelt Boulevard) and SR 687. Construction runs through spring 2017. Following the Gulf of Mexico barrier islands in southwest Pinellas County, State Road 699 travels 16.49 miles north from St. Pete Beach to Indian Rocks Beach. The route is more popularly known as Gulf Boulevard, which it follows for its entirely except between 75th Avenue and Blind Pass on Sand Key. Florida 699 used to continue further south and north from its current end points. The southern extension took it along Pass-a-Grill Way between Pinellas Bayway and Pass-a-Grille Point. North from Indian Rocks Beach, Florida 699 continued along Gulf Boulevard through to the then tolled Clearwater Pass Bridge linking Long Key with Clearwater Beach Island. Additionally an east-west branch was signed along Madeira Beach Causeway. This is now Florida 666. Some historical maps, including the USGS Quadrangle map, also show Corey Causeway (Florida 693) as another east-west branch of Florida 699. Pinellas County Road 1 follows Park Street from Central Avenue in South Pasadena north to Pinellas County Road 694 (Park Boulevard). Starkey Road extends the route north from Park Boulevard to Florida 686 (East Bay Drive). Keene Road represents the northern leg of the county road between East Bay Drive and Florida 60 (Gulf-to-Bay Boulevard). A separate County Road 1 is signed in western Pasco County. A major east-west boulevad, 38th Avenue North doubles as Pinellas County Road 184 between U.S. 19 Alternate (Tyrone Boulevard) and U.S. 92 (4th Street North) across the city of St. Petersburg. The county road designation is one of the better marked routes within the county. 54th Avenue North comprises a main arterial from Pinellas County Road 1 (Park Street) to U.S. 92 (4th Street North) through Kenneth City, Lealman and a portion of St. Petersburg. The four-lane roadway is also Pinellas County Road 202, though signs are sporadically posted. Pinellas County Road 296 is fairly well signed along Bryan Dairy Road and 118th Avenue North within the Pinellas Park and St. Petersburg area. The highway begins as a freeway spur leading west from Interstate 275 to 31st Court North at 118th Avenue North. Construction is underway to add the tolled Gateway Express (SR 690) along the CR 296 right of way west from I-275 to U.S. 19. Pinellas County Road 501 follows Belcher Road from Park Boulevard (CR 694) north to CR 816 in Palm Harbor. The Belcher Expressway was proposed in 1965 along 10.6 miles of Belcher Road through Pinellas Park and Largo as an alternative to U.S. 19. Plans for the freeway were canceled in 1978. County Road 611 travels nearly the height of Pinellas County, originating in Gulfport and extending north to the Pasco County line near Tarpon Springs. Through St. Petersburg, Lealman and Pinellas Park, CR 611 follows 49th Street North, a varying four-lane boulevard or six-lane arterial. Crossing western reaches of Old Tampa Bay, CR 611 upgrades to an expressway over the Bayside Bridge to SR 60 (Gulf to Bay Boulevard) at Clearwater. McMullen Booth Road continues CR 611 north with four to six lanes along the Safety Harbor city to northeast Clearwater. Spanning Lake Tarpon Canal, CR 611 shifts onto East Lake Road through northern Pinellas County. Passing east of Lake Tarpon, CR 611 becomes CR 77 (Seven Springs Boulevard) across the Pasco County line en route to New Port Richey. Pinellas County Road 689 follows 9th Street North from Florida 595 (5th Avenue) to 84th Avenue North, where it transitions onto Haines Road northwest to U.S. 19. 22nd Avenue North is a four-lane arterial varying as a canal lined route, commercial boulevard or forested street across St. Petersburg. The avenue starts as a local street from Park Street off Boca Ciega Bay. Heading east, 22nd Avenue North expands to four lanes from Tyrone Square Mall and U.S. 19 Alternate (Tyrone Boulevard) east through the Holiday Park area to U.S. 92 (4th Street North) at Historic Old Northeast. A portion of the route is inventoried as unsigned County Road 690.